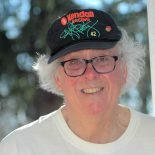 To see a video clip and copies of tweets from supporters, including one from Susan Sarandon, click on the following linked title. 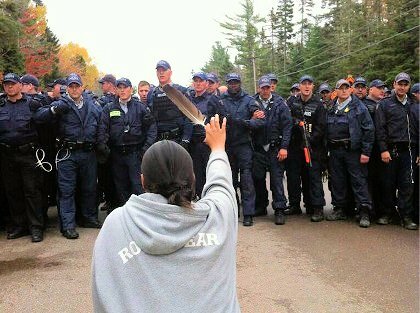 Protests are sweeping Canada following Thursday’s assault by paramilitary-style police on members of indigenous Elsipogtog Mi’kmaq First Nation and local residents as they blockaded a New Brunswick fracking exploration site. The group had barricaded a road near the town of Rexton in rural New Brunswick since September 30 to block shale gas exploration by SWN Resources Canada, a subsidiary of the Houston-based Southwestern Energy Co, that is moving forward without the community’s consent or consultation. Thursday morning, the Royal Canadian Mounted Police stormed the protest, donning camouflage uniforms, wielding rifles, and bringing police dogs to the site. Kathleen Martens with Aboriginal Peoples Television Network reports, “[a]t least four RCMP cruisers were burned” in the chaos following the raid. “The RCMP is coming in here with their tear gas – they even had dogs on us,” Susan Levi-Peters, the former chief of the nearby Elsipogtog aboriginal reserve, told Reuters. “They were acting like we’re standing there with weapons, while we are standing there, as women, with drums and eagle feathers. This is crazy.” The media is reporting that some protesters threw molotov cocktails at the police, who reportedly tear gassed the crowd. Well, Harper has made his move. May he come to regret it. This entry was posted on October 18, 2013 by fjwhite in community action, demonstration counterpower, economic counterpower, environmental activism, Indigenous people's counterpower, leadership, moral & ethical counterpower, political action, rights and freedoms and tagged direct action, fracking, New Brunswick fracking, Stephen Harper.